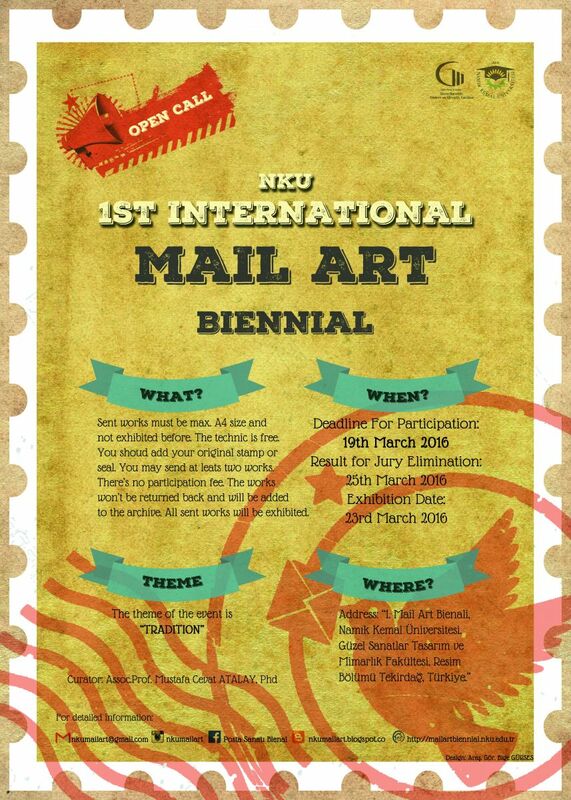 Namık Kemal University, Faculty of Fine Arts, Design and Architecture, 1st INTERNATIONAL MAIL ART BIENNIAL will be made. The theme of the event is “TRADITION” which has a powerful place in Turkish culture. The event is open to all artists and Mail Art volunteers from all around the world. The theme is determined as “Tradition”. The participants may attend the event at least with two works of A4 or formats smaller than A4 size as mail art. The works shouldn’t be exhibited previously. The works should contain original stamp or postmark. Exhibition jury will select two first, second, third and honour prizes. e-catalogue will be given for the participants whose works are exhibited. The works will be added to the stock of the Contemporary Painting Museum, which will be established by Namık Kemal University. The works won’t be returned. There is no attandance fee. Namık Kemal University Faculty Members, Advisory Commitee Members and acquaintances can’t attend the competition. The works will be sent to the address of “Namık Kemal Üniversitesi Tasarım ve Mimarlık Fakültesi Resim Bölümü, Tekirdağ, Türkiye.” The art works sent for the biennial will be published at the web site and the blog site. The jury will determine the ranking of the success and the attandances will be given a certificate of their rankings. There is no additional prize. The Exhibition Hall of Rectorate Building, Namık Kemal University Faculty of Fine Arts, Design and Architecture.